The Verizon Motorola Droid 4 handset will launch on Friday, the carrier has confirmed. The fourth iteration of the original classic Android handset will cost $200 on a two-year contract with Big Red from February 10th. The Droid 4 boasts a slide-out qwerty keyboard, 4G LTE connectivity and, with that in mind, Motorola is keen to point out that it's the thinnest-4G-device-with-a-slide-out-qwerty-keyboard at just 0.5-inches. 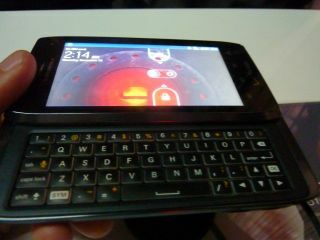 With Android Gingerbread on board (upgradable to Ice Cream Sandwich), the device also packs a 4-inch LCD screen and a 1.2GHz dual-core processor. The camera checks-in at eight megapixels, while it will shoot video at full HD 1080p. There's also a front-facing snapper for 4G video chat goodness. The Droid 4 also brings Motorola's new Smart Actions app, which promises to optimise battery life (handy considering the traditionally terrible battery life on 4G phones), while creating phone rules for certain times of the day. Check out our hands-on with the Motorola Droid 4 from the recent CES expo, where the device was launched back in January.